This item (P10595) is not currently available for purchase. The A - Frame Wren Hanging Bird House Rustic in appearance, this wooden bird house is intended for use by serious birdersPerfect for use by camps, schools, parks, and outdoor educational programs. 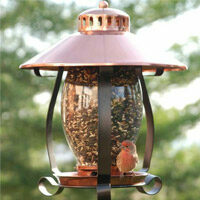 Bird house is constructed with Cedar and is made in USA.